The Autumn Tag by Georgina from Makeup-Pixi3. 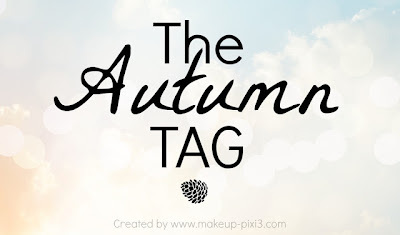 For Autumn, what is your.. When the weather starts to get colder, I love to get snuggled up in my blanket with a nice hot herbal/fruit tea. I also like to start getting my jumpers, knits and Cardigans out 🙂 I love Autumn/Winter clothes. I love drinking Herbal teas and fruit teas. My favourite ones are the Buttermint flavour, Lemon and Green tea, Lemon, strawberry and mango and peppermint tea. I love the smell of Sweet Cinnamon and Orange in candles. My favourite Lipstick has to be Barry M Lip Paint – Touch of Magic. It is a green lipstick but changes once on your lips to a lovely bright pink shade. I love the Cetaphil Moisturising Lotion. My skin always feels loads more hydrated. I always usually wear the same colours when it come to eyes shadows. I love a smokey eye. A nice silver and grey and i like to add a little bit of brown eyeshadow too. I the add my eye liner and mascara. I like wearing my grey cardigan with one of my scarfs, vest top, jeans and converse. I usually wear this to college as it is comfy and keeps me warm. It’s also comfy to wear when playing the drums. Some new jumpers, i love wearing them when the weather starts to get colder. I love my scarfs so i might treat my self to some from Primark as they have a huge selection in there. I love being at home but I also love going to Norfolk and having a walk in the woods and looking at all of the lovely scenery. There are some really nice towns and villages to look around including Hunstanton. I hope you enjoyed reading this. I tag all of you so please send me your links if you do it.